Don’t know about you, but it can be tiresome being constantly egged on to do this or that “because you’re worth it” (TM), no? If not that phrase because you don’t have TV/cable (like me ;-)) then maybe you’re hearing another refrain… that You’re not “living up to your potential” (Dark side of ER) or “so many generations before you sacrificed so much, for you to live a life like this”. OK, before you close this page in disgust, I’ll stop ;-). But you get the idea. A town mouse visits his cousin living in the country. 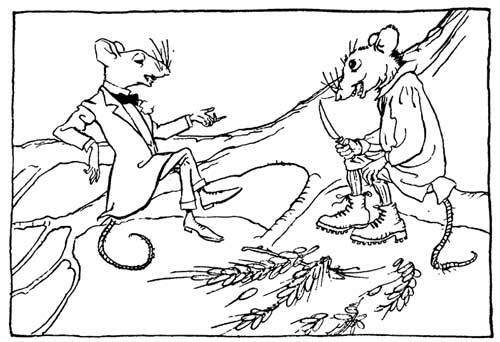 The country mouse offers his cousin from the town, a meal of simple country foods, at which the visitor scoffs and invites the country mouse back to the city for a taste of the “fine life”. But their rich city meal is interrupted, first by a cook, then by a cat, then by dogs, followed by the Master of the house himself, which force the mice to abandon their feast every time and scurry to safety. After this, the country mouse decides to return home, preferring security to plenty. “I’d rather gnaw a bean than be gnawed by continual fear”. Now, if you weren’t actually someone like Aesop (a slave) it could be said that your life was pretty peaceful in that era. In fact books like The Richest man in Babylon hark back to this sense of nostalgia in us by drawing on a life that’s gone by. But irritatingly, the book does so by juxtaposing our modern consumerist mindset and lifestyle memes into that timeframe, and offering solutions to break free. Now did you know that Beatrix Potter of Peter Rabbit fame retold Aesop’s mice fable in the year 1918, mainly because of a need to keep up a story deadline to her publisher. Now how did her rendering go? Timmy willie, a country mouse is accidentally carried to the city. and finds himself in a large house. He slips through a hole in the skirting board and lands in the midst of a mouse dinner party hosted by Johnny Town-mouse. Timmy is made welcome — and tries his best to fit in, but finds the noises made by the house cat and the maid frightening and the rich food difficult to digest. He returns to his country home after extending an invitation to Johnny Town-mouse. who then pays Timmy Willie a visit. He complains of the dampness and finds such things as cows and lawnmowers frightening. He returns to the city after telling Timmy country life is too quiet. I realize that what I am about to say could cause some misunderstandings, particularly in a would ravaged by postmodernism. A world where even facts have been reduced to opinions and all opinions are considered equally valid as long as the opinion holder — yeah, these days it’s less about what you say and more about who you are — does not show any signs of hypocrisy. To go off on a tangent, in a world with no objective values, the only way to be bad is to be internally inconsistent, that is, to be a hypocrite. The essence of boredom is to be found in the obsessive search for novelty. Satisfaction lies in mindful repetition(*), the discovery of endless richness in subtle variations on familiar themes. and not this wishy-washy “You can do whatever that rocks your boat, and it is equally valid because in the end, it made *you* happy”. It really gets my goat! Really! And Beatrix did a magnificient PR trick in the end of the story by stating her own preference for country living! Gaaaahhh! As to the story itself, what was the critics’ opinion? Something to the effect of: “Another volume for the Peter Rabbit bookshelf. Oh, such charming pictures and exciting letter press”…. More Gaahh! So, Please repeat after me: NOMO POMO (Check the comments for discussion on NOMO POMO). And if you want “true” happiness, here’s an ERE credo to mindfully repeat until you finally “get it”! It’s my “gift” to you. Enjoy! Be safe and Keep well. Surio: Didn’t know that link before. I love your use of a fairy-tail to drive home your point. Is it funny how money and finances can never truly be divorced from philosophy. In reality those that wish to retire early should first try and get an understanding of existence and then go for the former.